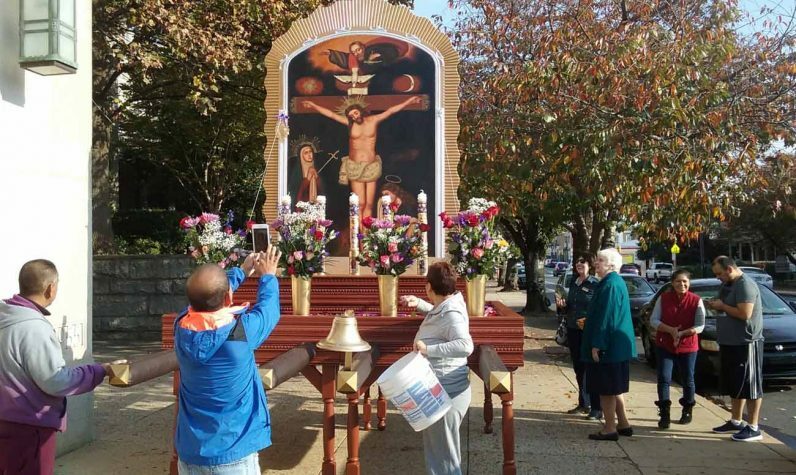 Over 300 of the faithful gathered to do some heavy lifting on Sunday, Oct. 30 at St. William Parish in Northeast Philadelphia’s Lawncrest section. Taking turns in groups of 20, men and women carried a large, 400-pound platform through the surrounding streets. Atop the platform, surrounded by flowers, was a painting of El Señor de los Milagros (“The Lord of the Miracles”) – an image of the crucified Christ designed by an unknown artist in 17th century Peru. Since 1998, the procession has been an annual tradition at St. William, a diverse parish with a number of vibrant ethnic communities. In fact, devotion to El Señor de los Milagros has its origins in community life. Around the year 1650, Angolan slaves living in Lima, Peru formed a prayer group. In 1651, one member painted an image of Christ crucified on a wall of the storeroom in which the group met. The image inexplicably survived two devastating earthquakes in 1655 and 1687, as well as a misguided attempt by authorities to destroy it in 1671. In gratitude for the image’s preservation, prayer groups began to process through the streets of Lima with a replica of the painting. Today the original image is housed in the sanctuary of Lima’s Las Nazarenas Church, and the annual processions through Peru’s capital draw up to 3 million participants. Although smaller in scale, St. William’s celebration brings the same faith from Lima to Lawncrest. St. William’s Peruvian community gladly shares this devotion with the parish as a whole. A painting of El Señor de los Milagros permanently hangs in the lower church’s sanctuary, where it is venerated throughout the year by parishioners of all ethnic backgrounds. Earlier in the week, students in the parish’s religious education program held an informal procession in honor of El Señor de los Milagros. 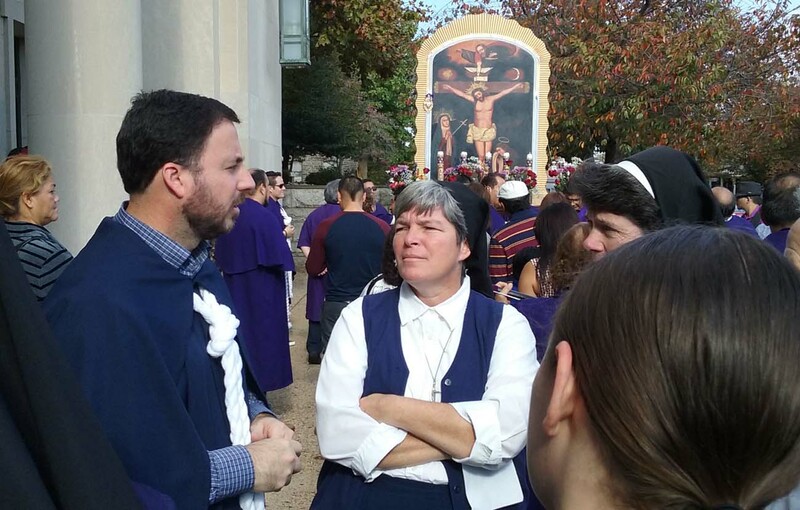 Noting the traditional purple robes worn by devotees, Father Alfonso J. Concha, pastor of St. William, observed that El Señor de los Milagros is a universal image that speaks to everyone. “Even if you’re not wearing purple today, you’re wearing it in your heart,” he said. Angel Gallegos, who built the procession platform, points out that El Señor de los Milagros is meant to encourage individuals living in community with one another, regardless of nationality.